For as long as I can remember, Academic Affairs and Student Affairs have operated almost completely independent of one another; at times one department has no idea what the other is doing until after it is done. It is as if issues in student affairs have no effect on academic affairs, and vice versa. Imagine what could happen if we actually worked together on issues and did not get territorial over every single decision. This is exactly what is happening the approach we are taking at my current campus. As the Vice Chancellor for Academics, I work with the two vice chancellors of Student Affairs daily. We are like the Three Musketeers. I speak to both Vice Chancellors on average 3-4 times a day via phone, instant message, text, email. I also just happened to be married to one of them, which is part of the reason we are able to work so well together. What we have learned is issues that appear purely academic in nature or purely student affairs in nature never are. The decisions I make for Academic Affairs will always seep into the departments of student affairs; it only makes sense for us to put our heads together first and determine the best course of action instead of scrambling to clean up a bigger mess later. A prime example of this practice is our SAP (Satisfactory Academic Progress) appeals committee. This committee consists of leaders from both Academic Affairs and Student Affairs but is a function of Student Affairs. Recently we invited all faculty members to some of these meetings. While faculty are often responsible to for completing the paperwork for these student appeals, they are often unaware of how Student Affairs weighs these decisions. Several faculty members attended these special appeals meetings, but most thrilled with just the invitation. The student affairs employees also had the opportunity to engage with faculty members they had never met! Just this small step opened the door for members beyond the Vice Chancellors from various departments to come on board with this new way of providing true wrap around services to our students. Wrap around services should not just apply to all the resources services student affairs offers, but every department of the college working together to help our students be successful. I believe the reason I think this way is because of the path my career has taken. The first six years of my career in higher education were in student affairs. Being the Registrar, I was stuck right in the middle of the two sides. While reporting to and being housed in student affairs, nearly 100% of my job responsibilities were academic in nature. It was during this time I realized neither side intended to leave the other out of important decisions regarding students; they just did not understand the impact on the other side of the house. The knowledge I gained from the different departments in Student Affairs is invaluable to my life in Academic Affairs now. I truly cannot imagine being able to make an informed decision without considering its effect on the records office, financial aid, admissions, disabilities services and even career services. I am very lucky to have worked in both student affairs and academic affairs and to have student affairs folks willing to work so closely with me for the good of our students and campus. In other campuses around us, this type of a working relationship is almost unheard of. Sometimes even the two Student Affairs VC’s do not speak to each other, so a relationship with the VC for Academic Affairs is unheard of! Trying to forge this type of relationship can be difficult when it has always been Academic Affairs or Student Affairs. The first step is simply communication. Regardless of which department you are in, begin telling your counterpart in the other department what your team is up to, issues you are facing, recent successes and even failures. Invite members of the other team to meetings and brainstorming sessions; some very innovative solutions have often come from an outside perspective. Start asking questions about other departments outside of your own. Faculty attending the SAP appeals meetings were the perfect example of taking the first step. Information shared; connections made across lines, in just a couple of hours of time. It is imperative that leadership not only support but also encourage these relationships across our self-imposed borders. Increasing graduation and retention rates is the responsibility of every one working at the campus, both Academic and Student Affairs. We can no longer afford to say, “That’s not my department, I work in X”. We have to function as one team, one campus like our students see us. Why not blur the line between Academic and Student Affairs as much as possible? Why not have a team of strong leaders working together on issues facing our students; folks who look at the problem through different lenses, coming from different perspectives. 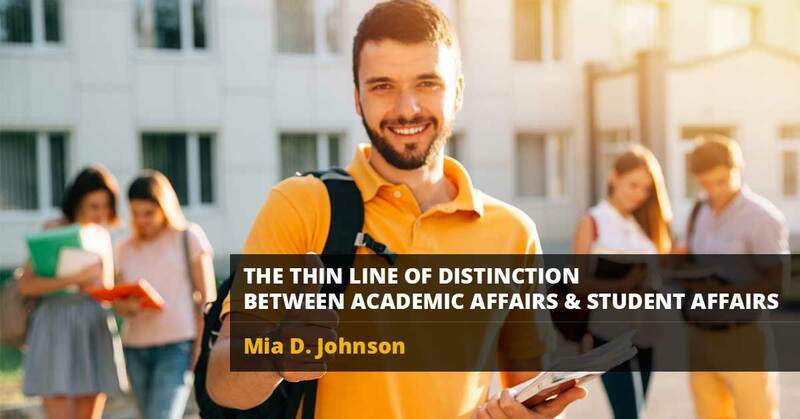 Most student issues cross the line between academic and student affairs, we cannot be afraid to cross the line with our students in order to help them succeed. 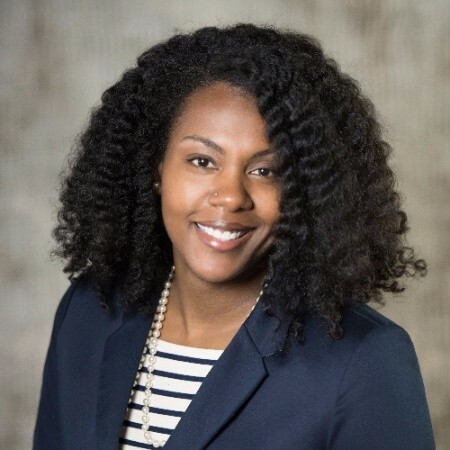 Dr. Mia Johnson is the Vice Chancellor for Academic Affairs, and Associate Professor of Human Services and Psychology at Ivy Tech Community College. She earned an Associate degree in Liberal Arts, a BA and MS in Psychology, her PhD in Global Leadership with a Higher Education concentration in 2016. She values time spent with her husband Wayne, and their two sons, Miles and Walker.